Washington wades deeper into the Middle East swamp. The civil war in Syria is on the verge of another escalation. President Obama, who last year rejected a joint proposal from Hillary Clinton, Leon Panetta, General Martin Dempsey and David Petraeus to get involved militarily, is under new pressure to intervene. Great Britain and France are toying with ending the arms embargo on military aid to the Syrian rebels, which so far has come mostly from Saudi Arabia and Qatar, with US encouragement. Under pressure from Democrats and Republicans, the Joint Staff of the Pentagon and the US Central Command have updated potential military options for intervention in Syria that could see American forces—if ordered—doing everything from bombing Syrian airfields to flying large amounts of humanitarian aid to the region, a senior US military official said. The chairman of the Senate Foreign Relations Committee, Bob Menendez (D-N.J.), has joined the growing chorus of lawmakers calling on the Obama administration to arm the rebels in Syria. The Syrian rebels are looking for heavy weapons, including antitank and antiaircraft weapons. But the problem continues to be that some of those weapons would fall into the hands of the overtly Al Qaeda-affiliated Nusra Front in Syria and other extreme-Islamist groups. Just this week came the stunning but not entirely surprising announcement that the Islamic State of Iraq, which is controlled by Al Qaeda in Iraq (AQI), is one and the same organization as the Nusra Front. In other words, the selfsame group that the United States is helping Iraq’s government fight in Anbar province and throughout Iraq is also the recipient of U.S. aid in Syria! 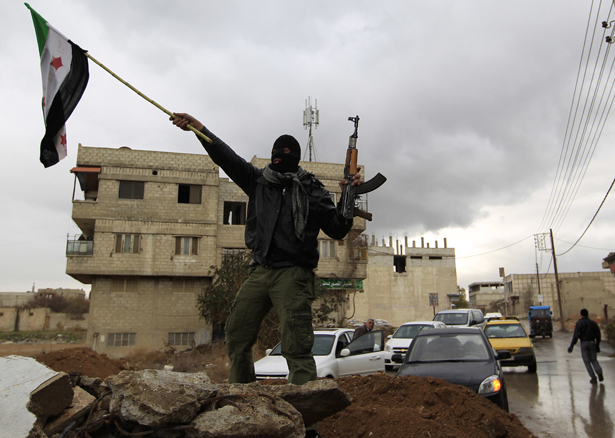 Al Qaeda's branch in Iraq said it has merged with a Syrian rebel extremist faction, in a push by the terrorist organization to exert more influence on the Syrian rebellion and its outcome. The declaration reflects cross-border coordination between al Qaeda in Iraq and Syria's Jabhat al Nusra, or the al Nusra Front, a force with growing battlefield clout that has been a target of U.S. efforts to isolate rebel extremists in Syria. The two groups are already closely linked; when the U.S. designated the Syrian group as a terrorist organization in December, it described al Nusra as an alias for the Iraqi group. The announcement from Iraq followed a statement on Sunday by al Qaeda chief Ayman al-Zawahiri calling on Syrian rebels to direct their fight at establishing a "jihadist Islamic state" there as they seek to overthrow President Bashar al-Assad. By recognizing their role in Syria's war, Iraqi Shi'ite fighters may gain recruitment momentum to help Assad, whose Alawite sect is an offshoot of Shi'ite Islam, in a war that is splitting the region along sectarian lines. Message to Obama: Stay out. Meanwhile, Israel is pressuring Obama to intervene in Iran. Read Robert Dreyfuss's take on the situation after the latest negotiations.